Pretoria (Tshwane), in Gauteng Province, is the administrative capital of South Africa and the 4th largest city in the country. It is about 65 km north of Johannesburg and about 45 km from OR Tambo International Airport. 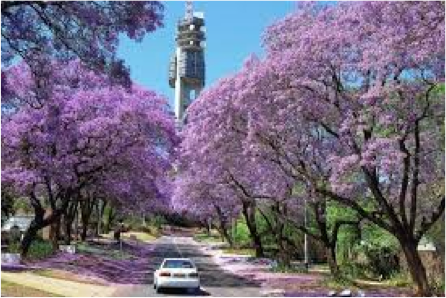 Known as "Jacaranda City" for its thousands of jacaranda trees, the city is also known for its universities and government buildings. The history and politics of South Africa continue to play out in this city. 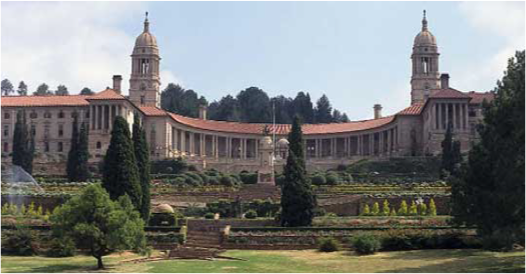 The semicircular Union Buildings encompass the president's offices and hosted Nelson Mandela's inauguration. Nearby is the massive Voortrekker Monument, honouring 19th-century Afrikaans settlers from the Cape Colony. There have been proposals to change the name of Pretoria itself to Tshwane, with discussions still ongoing. Freedom Park is situated on Salvokop in Pretoria. It includes a memorial with a list of the names of those killed in the South African Wars, World War I, World War II as well as during the apartheid era. Isivivani - Freedom Park. Construction of the monument was by Stefanutti Stocks overseen by Mongane Wally Serote. In March 2009, twenty-four deceased "liberation struggle heroes" were proposed for inclusion to the memorial. Some of the "national leaders" chosen include Steve Biko, Oliver Tambo, Helen Joseph, Albert Lutuli, and Bram Fischer. 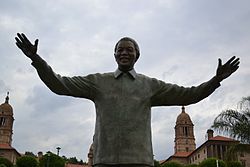 The National Heritage Monument is a group of copper statues representing anti-apartheid activists, Zulu chiefs and missionaries. The monument is meant to reflect the struggle for liberation going back into the 1600s. It is located in Groenkloof Nature Reserve. The project was started in 2010, but as of 2015, only has 55 statues. A total of 400 to 500 statues are planned. When complete, the monument will be called "The Long Walk to Freedom.